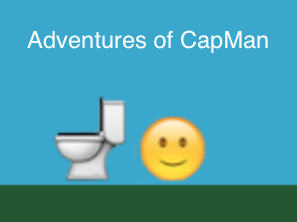 "It's like a platformer version of PacMan but with emojis... and toilet humor." Fill CapMan up with food, but don't give him too much or he'll explode! Use the arrow keys to direct CapMan around the level while he munches food. Keep an eye on him though, he tends to eat too much and go 'pop'! When it looks like CapMan isn't feeling good, direct him to the toilet before he eats more food! Level too difficult? Hit the "Move Platforms" button to move the platforms around - it'll cost you points though! Munch all the food without exploding to win!